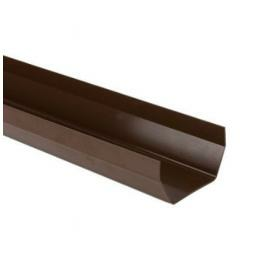 Our Brown Square Guttering and Fittings combine modern aesthetics with a traditional finish. Suitable for all property types, the products in this range will protect the structure of your home as well as its foundations. With highly effective water channelling and secure, strong fixings, you won’t have to worry about rainwater penetrating your roof or eroding soil in your garden. We recommend Brown Square Guttering and Fittings for a all project types - from repairs and replacements to new-builds. It looks great all around your home, your conservatory and outbuildings. If you are replacing sections of round guttering with square gutters, we stock square to round connectors as well as the full range of square fittings. Guttering is an integral part of a property. Our products and manufactured to provide a robust water channel. It performs well all-year round and can withstand a wide range of temperatures. Use these products if you are looking for a guttering system that is easier to maintain that traditional alternatives and will never need painting. We stock Brown Square Guttering and Fittings in a choice of sizes so you can be confident you are investing in a robust drainage system. Our Brown Square Guttering and Fittings are practical but won’t let the exterior of your property down. Well designed and modern, they give any property a stylish look. We supply guttering products to homeowners and trades. Please see individual product pages for stocked sizes/measurements. Looking to replace outdated or broken guttering? Building a new extension, outbuilding or home? Our PVC Brown Square Guttering and Fittings range is the perfect choice because it is easy to install. It is also economical and extremely low maintenance. For long-lasting protection from rainwater, invest in effective PVC guttering that will take the worry out of protecting your property. That’s right - we deliver Brown Square Guttering and Fittings nationwide. You can view our entire range from the comfort of your home and order online whenever you like. Our fast order processing, means you can expect to receive your guttering products normally within 3 working days. Benefits of ordering from us include great products, low prices and exceptional customer service. Save yourself time and money - invest in PVC Brown Square Guttering and Fittings and protect your home for years. Need some help with something? We provide free technical support. For advice, contact us online or give us a call. Brown Square Guttering and Fittings are a savvy investment if you want an effective water channelling system that will enhance the exterior of your home and provide long-lasting protection from rainwater.